Analyse how Carol Ann Duffy uses structure to convey meaning in ‘Row’, explore Anita Desai’s first-person narratives and engage with characters in Tennessee Williams’ play The Glass Menagerie. 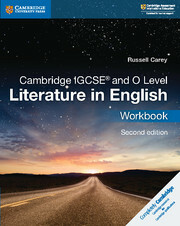 This Cambridge Elevate edition encourages an enjoyment of literature while helping students write critical essays. It contains poetry, prose and drama from around the world to appeal to international students aged 14–16. This digital resource takes an active approach to learning and stresses the importance of developing informed personal responses on close textual study. Indicative answers to coursebook questions are in the teacher’s resource and further practice is available in the workbook. Take an active approach to literature: Activities use active learning techniques – for example, some require students to act out scenes to encourage them to think about characters and plot. 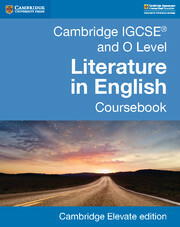 Understand the aims of the course: The introduction provides a clear overview of Cambridge IGCSE and O Level Literature syllabuses so students know what to expect. 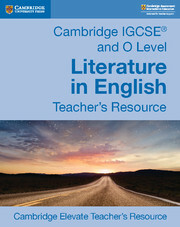 Analyse poetry, prose and drama: With a rich variety of texts and guidance on answering different question types, students learn to tackle each element of the course. Improve writing skills: Top tips and sample answers help students develop their critical writing skills and essay technique. Approach any text with confidence: Strategies for dealing with unseen texts help students overcome common concerns and develop the skills they need. Encourage students to reflect on their learning: ‘Check your progress’ sections summarise the key points of each unit and encourage self-evaluation. Inspire students to explore other texts: Further reading boxes and extension activities provide extra challenge. Cambridge Elevate is simple to navigate for both students and teachers – find notes quickly with highlights and bookmarks, and link directly into Cambridge Elevate from Moodle, Blackboard and any other VLE.